This title has only slightly more to do with the movie than does this bird. Tigon had the distinction of not being Hammer Studios. It wasn’t even Amicus, which produced movies that casual viewers mistook for Hammer. 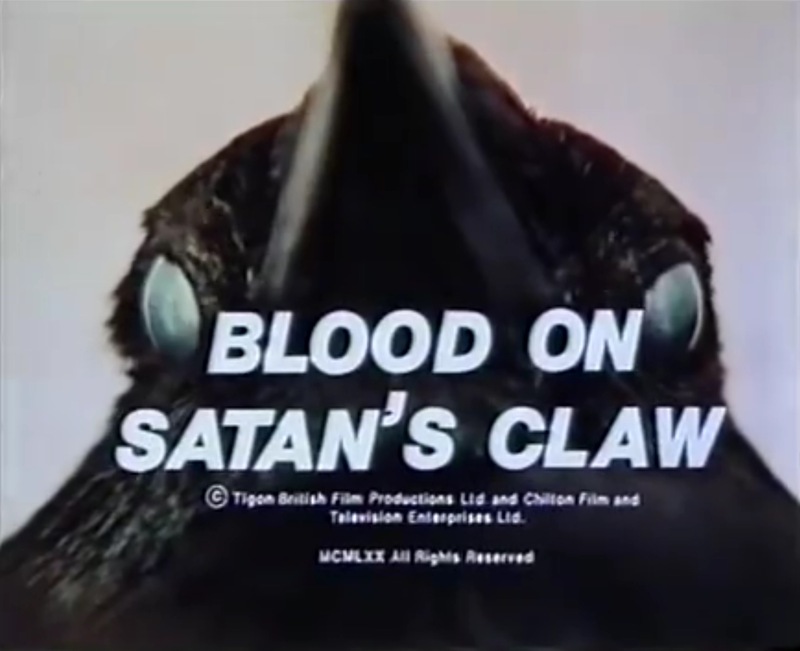 Still, with modest budgets Tigon was able to make a few of the more memorable British horror films of the 1960s-1970s. Witchfinder General showcases Vincent Price in his most purely villainous role, and The Creeping Flesh is an enjoyable monster flick featuring Peter Cushing and Christopher Lee as scientists combating evil itself. In my opinion, the studio’s greatest achievement was the 1971 satanic thriller Satan’s Skin , aka The Blood on Satan’s Claw . Set during England’s interregnum, the action of the film takes place in a secluded village. An eerie humanoid skull, covered in clumps of fur, turns up when farmland is plowed. The bones go missing, and soon the youth of the village begin acting strange. They stop attending religious instruction and begin playing deadly games in the woods. Strangest of all, several grow odd patches of fur on their skin. It’s up to The Judge, local representative of order and modern society, to stop the Devil from assembling a new body on Earth. 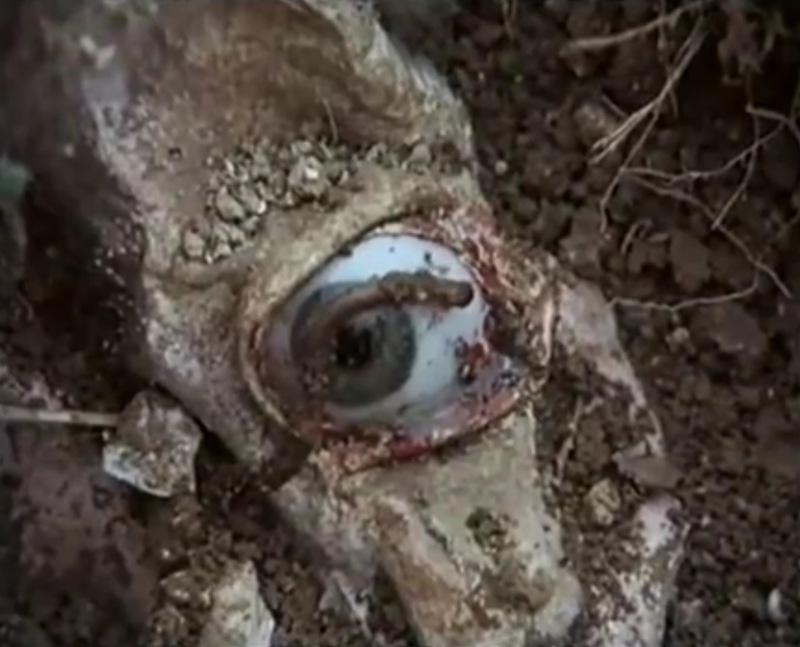 The worm on Satan’s eye. This isn’t a perfect movie. The music is irritating and often at odds with the mood of the moment. While stalwarts like Patrick Wymark and Anthony Ainley anchor the cast, the many children are of wildly varying ability. The pacing compares unfavorably to glaciers. Yet there is much that works in its favor. Unable to afford the lush sets of richer studios, much of this film was shot in actual locations — locations that, by and large, were cramped and decayed. The dinginess of the movie, the claustrophobic rooms in the open countryside: it all sets a mood of fear and decline that fits nicely into the themes of ancient evil and religio-political upheaval. The setting of the film is perfect. With the established power structures disrupted by the Interregnum, it’s unclear who can address the contamination of the youth. The local representative of the church is only barely able to resist temptation himself, and the only law presence is a judge who spends most of his time in London and considers the rural people to be ignorant and superstitious. The order of the land has been upset, and evil will make use of the disruption to gain a foothold. All in all, it’s a nice little apocalyptic movie that shows what can be done within the constraints of a meager budget.